“A beautiful, mesmeric piece of work … there are no low points here. Here is a space that explores the grotesque, amusing and heartbreaking aspects of mermaids, as well as the fairytale portrayals we’re all so familiar with. Our brand new full-colour, 52-page anthology is now available for immediate dispatch for £10 + p&p in just one click. Checkout with Paypal below for a safe and secure purchase. If you’d prefer an alternative method of payment (such as a cheque), feel free to get in touch at poemsunderwater @t gmail dot com. We are super-fast when it comes to posting orders. We will post your order the same day if you order by 5pm, and early the next morning for orders placed after 5pm. If you’re based abroad, we’re happy to ship to you but p&p is probably a little bit more than it is within the UK – please email your location to poemsunderwater @t gmail dot com and we’ll figure out how much this is likely to be. Thank you very much for purchasing ‘Lines Underwater’, we hope you enjoy it. We’d love it if you could let us know what you think of the book, either by commenting here, sending us an email, or leaving us a comment on our Facebook, Twitter, or Goodreads pages. This is an independently published anthology, and we appreciate your support! In order of appearance: William Kherbek, Christopher Brown, Rebecca Gethin, Tony Winn, Katie Hale, Andrew Howell, C.R. Resetarits, Jennifer Brough, Jeanette Stevenson, Ieuan Edwards, Sara Eliot, Agnes Marton, Cheri Allcock, Piotr Cieplak, Karen Tang, Kirsten Tambling, Sarah McKee, Sue Wood, Christopher Mulrooney, Nicola Moorhouse, Phoebe Power, Polly Atkin, Andrew Souter, Bernd Sauermann, Kate Noakes, Ron Carey, Michele Brenton, Charlotte Higgins, Claire Trévien, Luciana Francis, Marie Naughton, Adam Steiner, Hilary Hares, Virginie Colline, Debby Akam, Jo Stanley, Meredith Knowles, Philip Burton, Chelsea Cargill, Jessica Taylor, and Ella Risbridger. Thank you to everyone who’s been involved in our project, by coming over to our website and submitting work to us. Thanks, too, to people who took the time to let us interview them and gave us comments about mermaids and their doings, especially Susan Wicks, Leo Geyer, and Martin Kratz. And thank you to everyone whose fabulous work appears (or is soon to appear) on our website: May Dy, Penny Pepper, Sal Jones, RV Williams, Graham Burchell, Gill McEvoy, Katherine Shirley, Stephen Devereux, Denise Weaver-Ross, Kimberley Hayes, Oliver Comins, Loz Atkinson, and Sandra Burnett. It’s free to enter and is going to feature lots of fantastic things from people like Extra Bones, Dead Trees & Dye, and Melon Shrub. We are going to bring some copies of our mermaid anthology ‘Lines Underwater’ to the fair, so come and say hi and get a copy if you’d like your very own book of new artwork and writing featuring mermaids! Take a look at a couple of the pages. Copies can also be bought right now from our online shop. Zines of the Zone is a travelling library of independent and self-published printed works containing, and relating to, photography. It’s going everywhere from Barcelona to Athens, and will be exhibiting the pieces it’s collected at special events in every city it visits. We were very happy to hear about this fantastic project, and to donate a copy of our mermaid anthology ‘Lines Underwater’ for inclusion in the travelling library and exhibition. Here on our website, you can read about some of the photography in our anthology, which ranges from a semi-animate bench and a romantic turtle to a mermaid’s-eye view with an underwater camera and a wiry siren (seen here in its fleshless glory), as well as lots of photographs by Kirsten Tambling. You can also take a look at some of the other artwork involved in our project. And make sure to try and catch us at Zines of the Zone when it comes to a city near you. If you’d like to buy a copy of the anthology for yourself, it’s only £10 + p&p. Thanks to everyone who came to our launch event at The Bird’s Nest on Friday 4 October. We are now open and on display in the Undercurrents Gallery, Deptford, until 30 October, so do pop by (there are also some events planned at the gallery as part of the exhibition). As part of our residency at the Undercurrents Gallery throughout October, we’ll be hosting a zine and DIY fair open to all and free entry. We have a limited number of tables available for artists or zine-makers who want to sell their work during the day. 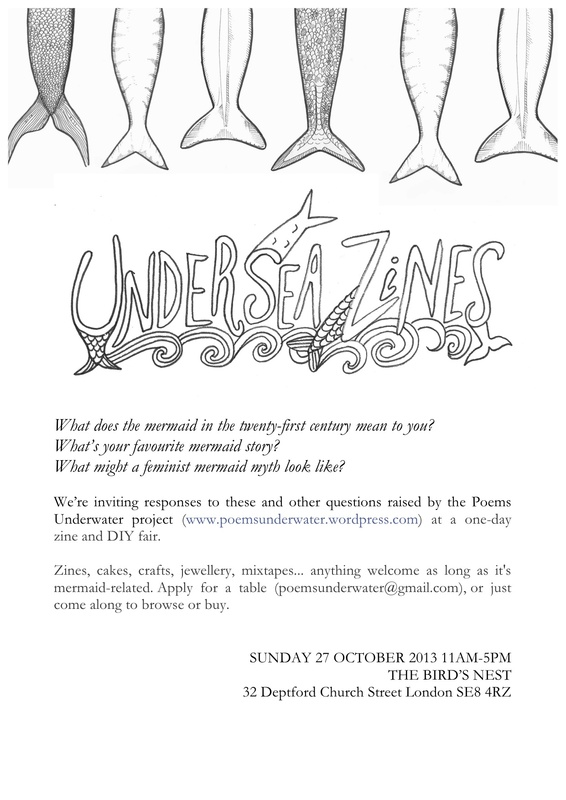 If you’d like a spot, please send some mermaid-related samples to poemsunderwater @t gmail.com. We’re also inviting people to come along and bring their own work to swap or share. As long as it’s mermaid-related, we’d love to see it. You can also find out more and join the event on our Facebook page. Don’t miss our residency at the Undercurrents Gallery, Deptford from next Friday, 4 October 2013! We’ll be collaborating with the Minesweeper Collective (who hosted our launch event on the 14th) to offer a programme of events around the theme of maritime urban legends. Launch event hosted by the Minesweeper Collective, featuring live music and poetry. Last night of the exhibition! Live sea shanties from 7pm till 1am. 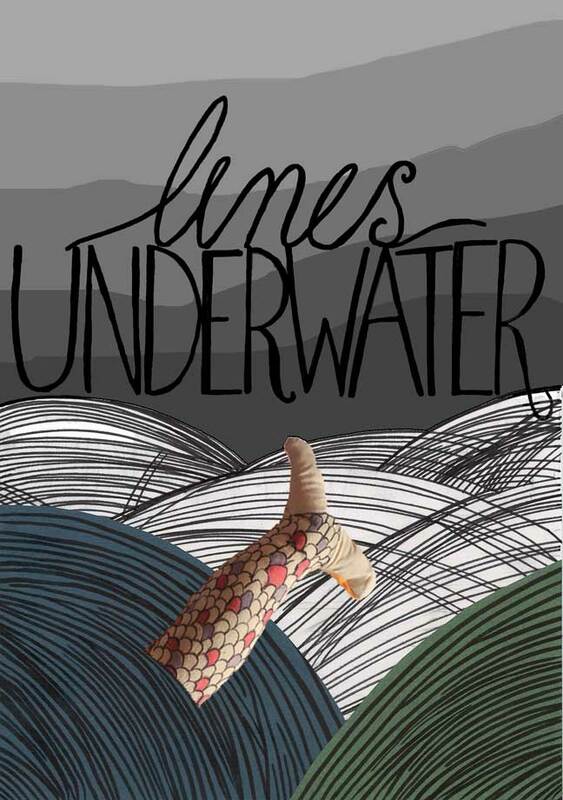 Each event will also include an opportunity to buy our anthology ‘Lines Underwater’. If you’ve got your own mermaid stories to tell or mermaid-themed music to play, we’ve got slots available throughout the month – get in touch to tell us your idea. To stay up to date, you can also join the event on Facebook. Poems Underwater set sail last night on board a boat in Deptford (courtesy of the brilliant Minesweeper Collective). We launched our new anthology, Lines Underwater, exhibited some of the artworks made as part of the project, and heard readings from some of the poets and writers involved. Musicians Tony Winn, Andrew Souter, Luciana Francis and Sara Eliot performed sets, and we had a splendid mermaid cake (you may remember the original one) courtesy of Alice Saville (RaddingtonB). Karen Tang’s Siren Stephen and his Mirror in our exhibition. Photos from our own underwater visits, looking out over Deptford Creek. Michele Brenton’s Spartia at Dusk, with Loz Atkinson’s piece. Thank you so much to everyone who came along, performed and helped make it such a great night. If you missed it, you can see the artworks from this exhibition, along with a few extra, at the Undercurrents Gallery, Deptford, from 4 October – 1 November 2013. We’ll also be publishing details of events running alongside this in the coming weeks, so stay tuned. air sea rescue – it just isn’t fair. We’ve had lots of exciting deliveries this week, and many things to do as we prepare for our special launch event on Saturday (including some sheet painting, so we now have a flag). We’re fully booked for Saturday, but if you’re missing out, don’t worry – you can come and see us for the whole month of October at the Undercurrents Gallery, Deptford. Here, we’ll be exhibiting selected works from the anthology and running a number of projects and events. We’re delighted to announce that we’ll be exhibited selected artworks from the project at Deptford’s Undercurrents Gallery from Friday 4 October 2013 until the end of the month.